We understand choosing the perfect RV to suit your needs can be complicated because there are so many different vehicle types and brands to choose from. 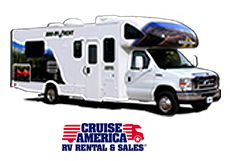 Those seeking the widest range of depot locations and quality RVs will fall in love with the range offered by Cruise America. Having been in the business for over 40 years, this family-owned company know what it takes to make your RV vacation one to remember, and offer safe, sturdy, comfortable and easy-to-operate vehicles, suitable for groups of up to 7 people. Vehicles are categorized into four sizes: compact, standard, intermediate and large, making your choice of RV simple and straight-forward. All RVs are also uniquely printed with colourful images of some of America's most iconic destinations, allowing you and your Cruise America RV to stand out from the crowd. With an impressive 24 locations to pick-up and drop off from, the choice is easy with Cruise America. 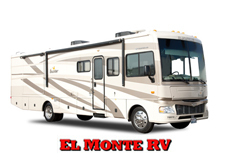 If you are looking for the largest selection of slide-out vehicles, El Monte will surely have a vehicle to suit with over 9 vehicle types to choose from. Vehicle models range from 2006 upwards. Most of El Monte's depots are open 7 days a week and provide a courtesy transfer service to and from selected airports and hotels. All motorhomes are 100% walk-thru, are modestly branded, and are equipped with a 110v generator, microwave oven and CD player. Mileage packs can be purchased and there is even an option for unlimited mileage for international travelers. If you opt for the Standard Package extras available to hire include personal convenience kits, kitchen kits & generator usage. Good news for pet lovers! Take your best friend for a small additional fee. Escape Campervans pride themselves on creating affordable, fun, reliable and economical travel within the USA. It is a refreshing company that offers a high level of service, commitment to low prices and uncomplicated rental terms. Escape Campervans (or minibagos as they are sometimes referred to as) are among the most fuel efficient in America. They are the perfect compact vehicle and provide enough room to seat four passengers or sleep three. These uniquely hand painted vehicles also include 100 miles free per day along with camp chairs. For those looking for that little bit of extra freedom we recommend upgrading to an unlimited mileage package. 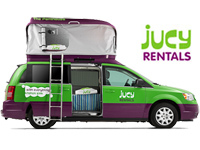 Since 2001 Jucy has been one of the fastest growing campervan rental companies in Australia and New Zealand and they have now brought their unique brand to the US. The Jucy Champ RV boasts all the features a small, modern RV should, including a fridge, gas cookers, sink, DVD player and two comfortable beds, suitable for sleeping up to four people. It is super easy to drive and stands out from the crowd with its bright green and purple colors. Jucy RV depots can be found in Las Vegas, Los Angeles and San Francisco, making Jucy the perfect option for West Coast travelers on a budget. 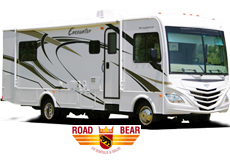 Road Bear RV offer the newest luxury RV vehicles in the industry and are all under 12 months of age. All vehicles are equipped with awning & generator, most with slide-outs and TV/DVD. Road Bear RV are said to have the largest beds, freshwater tanks & outside storage. Another little touch of luxury is the hardwood floors. Mileage packs of 500 miles per package are an additional cost on the Standard Package for all travelers. If you are an international traveller visiting the US we recommend an unlimited mileage, which will give you that extra bit of freedom. 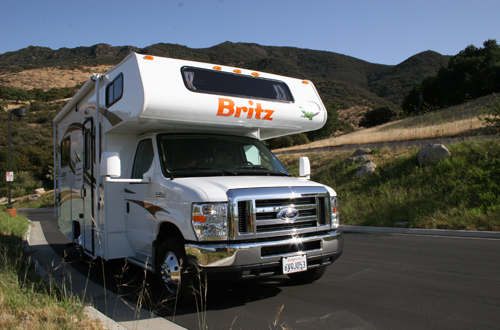 Britz Motorhomes is Australasia’s leading RV rental company, has made its way to the United States of America, offering holidaymakers to the USA more choices from the company that also operates Road Bear RV. They offer the perfect balance between price and comfort. They are expertly maintained, comfortable and offer great value for your money. The availability of Britz Campervans is good, while their affordable pricing makes them a great choice for the budget conscious traveller who still values comfort. All vehicles offer an awning, camping table, generator, spacious outside storage (for suitcases, outdoor equipment etc), large fresh water tank and dry bath. Complementary airport and airport hotel shuttle. Personal vehicle orientation provided by multilingual staff.